Brewery tasting today! – Eat, Drink, and Go! Randomosity (new word) led us to the Flying Dog Brewery today. Great flight of mostly stouts and porters. The coffee ones were excellent, but the star of the show was their whiskey barrel aged Gonzo. So smooth and rich, with the sweet notes of a bourbon and the smooth silk of a well-crafted beer. Me like-y! And me buy-y because the best result of a tasting is being buzzed enough to buy what you want and not what you want to spend!! 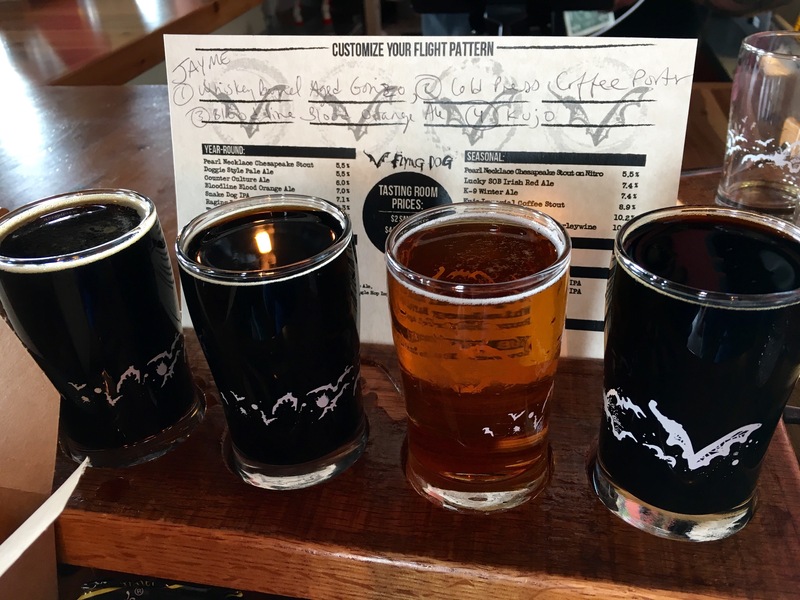 Great post on the FD Brewery… I love that place… had a great time with a beautiful woman! Heard on mainstream radio yesterday Thursday, the radio personalities from DC 101 were broadcasting from Flying Dog Brewery till 7:00 pm! They said Gonzo was show stealer and that they are hoping to be a destination rather than a pub. They gave props to new laws allowing customers to enjoy more than 1 flight per visit. I was so glad to hear we aren’t Pilgrims anymore. No offense intended to those who have an affinity for dressing in black and white. That may be a Republican thing – Gov Larry of MD appreciates that we shouldn’t have to only try 1 flight and hit d rrrroad . Or that may simply be a universal truth.